One advantage of choosing this thermostat is that it is regularly priced. This currently goes for a little over $120 dollars, which isn’t very expensive for a unit so impressive. What’s good about this model is that it is compatible with most brands of central heating, cooling and heat pump systems. With this, you can be sure that you’re getting your money’s worth from the minute you hook it up with your HVAC system. The primary flaw which serves as a ‘turn-off’ for most potential buyers is that you need a monthly subscription with Nexia before you can fully utilize its great features and remote access capabilities. If you want to try out the Nexia Home Intelligence, you must first buy a Nexia Home Bridge, which is sold separately. And then you need to make and activate an online Nexia account, as well as pay a monthly subscription fee of $9.99 dollars. This is only so you could use the thermostats awesome features. That may be too much to handle for some, so many reviewers turned their backs on this model. It can still be great though, if you can get a good Z-Wave hub. Also keep in mind that this thermostat is not compatible with radiant floor and wall heating systems. Read Our opinion about Trane Z-Wave Thermostat. Our home is a personal sanctuary that provides us with our much-needed space for relaxation and tranquility. In these sanctuaries we could say we are totally in charge, and we are the boss. But have you ever wanted to have even more control over your space, to the point where everything is under your command? Well, with a home automation hub, that is close to possible. In fact, here on this review, we are going to explore a certain thermostat that works best under one of these ‘Z-Wave’ hubs. The Trane Z-Wave Thermostat is a model that you can take full control of, with the use of only your fingertips! This works best alongside your favorite smart devices, all of which are controlled by your smart phone or any other compatible device that is connected to the internet. In this case, this unit is endorsed alongside the Nexia Home Intelligence. Both the thermostat and the Z-Wave hub promise to give you the best possible service, so that you can become even more at home in your own home. Here we will show you all the things that make up this thermostat, and why you should consider having one for yourself. Take out your pens and notepads, because we are going to explore all the pros and cons of this great thermostat. Not sure about this Trane Z-Wave Thermostat? Then check out the other THERMOSTAT REVIEWS. From the moment you read this article, you discover that this is no ordinary thermostat. 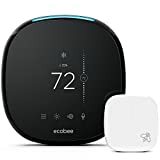 It has a big and obvious difference from the rest of the models out in the market today, and that is saying something for a seemingly regular, programmable thermostat. This is actually a Z-Wave thermostat, meaning this is used for home automation. If you want all your devices connected into one organized system, you need a Z-Wave hub. And for temperature-adjusting purposes, this is the thermostat to go for. With the combination of this programmable unit’s high quality service, and the Nexia Home Intelligence, you can have a convenient way of keeping your home at a comfortable temperature at all times. Of course, that goes without saying that you can go with other Z-Wave hubs if you believe they would work better than Nexia, and if it is also compatible with this model. The freedom is always yours. 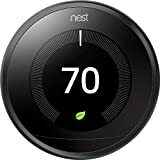 Any home automation hub should let you connect to this thermostat even when you are not at home. The manufacturers recommend Nexia, saying it will let you monitor and schedule your house’s heating and cooling system. This is a convenient feature and it works okay with the thermostat, to say the least. Thanks to this Trane Z-Wave Thermostat, you can easily set different schedules for each day of the week, with up to 4 automatic settings per day. That is a lot of flexibility to work with. This allows you to optimize your energy saving efforts, and eventually reduce your energy bill. According to the manufacturers, this thermostat is capable of reducing your home’s energy consumption rate by up to 10-15 percent. There’s more to this Z-Wave thermostat than just great looks and effective functionality. It also comes with a set of features that ought to impress any homeowner seeking for an HVAC system upgrade. First of all, it has a simple white frame that houses a rather small screen. The color lets it fade into your wallpaper or any background you install it on. This is great because you don’t want your thermostat to be stealing the spotlight from any of your other wonderful furniture and appliances. The LCD screen is small, but has a bright blue backlight. This makes it easy to read even in the dark. However, it does not employ a touch screen function, and instead gives you a few buttons to use. This may be a check against its favor, because there are a lot of other units out there that have this common feature. The buttons are easy to handle, so it is not a big problem anyway. Additionally, this Trane Z-Wave Thermostat lets you receive text or email alerts regarding your home’s temperature, especially if it strays a bit below or above your desired range. This lets you make adjustments accordingly, even when you are not at home to manually push the buttons. You can even view energy management charts to see how you can optimize the use of your heating and cooling system. A lot of reviewers will recommend that you steer clear of the Nexia Home Intelligence if you are to purchase this model. This Trane Z-Wave Thermostat works great on its own, but you may have to find a better, compatible Z-Wave hub for it. This is so you can enjoy the home automated features to the fullest of its capability.